Tranmere were relegated to League Two as they lost to Bradford City - after results went against them elsewhere. 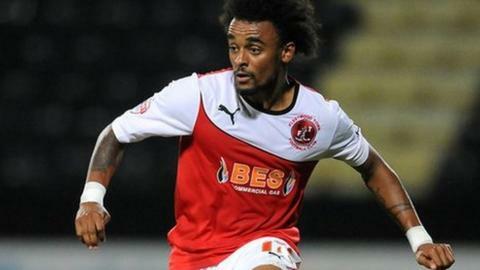 Crewe Alexandra's win over Preston and Notts County's point at Oldham were enough to relegate Rovers. But Tranmere surrendered a lead given to them by Matthew Pennington's early strike to increase the suffering. After on-loan winger Junior Brown was red-carded on 31 minutes, City came back to beat 10-man Rovers with late goals from Jon Stead and Aaron McLean. The Bantams equalised on 81 minutes when Stead's shot found the bottom-left corner. And McLean sealed Tranmere's fate when he found the same spot from 16 yards out six minutes later. Rovers return to English football's fourth tier after spending 13 seasons in League One. Match ends, Tranmere Rovers 1, Bradford City 2. Second Half ends, Tranmere Rovers 1, Bradford City 2. Corner, Tranmere Rovers. Conceded by Jon McLaughlan. Attempt saved. Matthew Pennington (Tranmere Rovers) right footed shot from outside the box is saved in the top centre of the goal. Attempt missed. Ryan Lowe (Tranmere Rovers) right footed shot from the left side of the box is close, but misses to the right. Corner, Tranmere Rovers. Conceded by Andrew Davies. Substitution, Tranmere Rovers. Jake Kirby replaces Liam Ridehalgh. Substitution, Tranmere Rovers. James Rowe replaces Max Power. Attempt missed. Kyle Bennett (Bradford City) left footed shot from the centre of the box is too high. Corner, Bradford City. Conceded by Matthew Pennington. Attempt blocked. Aaron McLean (Bradford City) right footed shot from the right side of the six yard box is blocked. Goal! Tranmere Rovers 1, Bradford City 2. Aaron McLean (Bradford City) right footed shot from the right side of the box to the bottom left corner. Assisted by Kyle Bennett. Corner, Tranmere Rovers. Conceded by James Meredith. Goal! Tranmere Rovers 1, Bradford City 1. Jon Stead (Bradford City) right footed shot from the centre of the box to the bottom left corner. Assisted by Mark Yeates. Jean-Louis Akpa-Akpro (Tranmere Rovers) wins a free kick in the defensive half. Corner, Bradford City. Conceded by Ian Goodison. Corner, Bradford City. Conceded by Steven Jennings. Substitution, Bradford City. Raffaele De Vita replaces Nathan Doyle. Attempt missed. Mark Yeates (Bradford City) left footed shot from outside the box is too high. Ryan Lowe (Tranmere Rovers) wins a free kick in the attacking half. Attempt blocked. Aaron McLean (Bradford City) right footed shot from the centre of the box is blocked. Attempt missed. Kyle Bennett (Bradford City) left footed shot from outside the box is close, but misses to the left. Kyle Bennett (Bradford City) wins a free kick in the attacking half.